Waiting. Waiting. Checking greenhouse heaters. Checking the extended forecast. Drinking tea. The sweet Yogi brand of tea has a positive message attached to each tea bag. This past week, a tea bag selection brings the message ‘Patience pays.’ We wait some more. Taking deep breaths. Planting too early does no one any good. Calling our peer farmers. Last year we had tomatoes planted in the high tunnel (unheated greenhouse) by now. 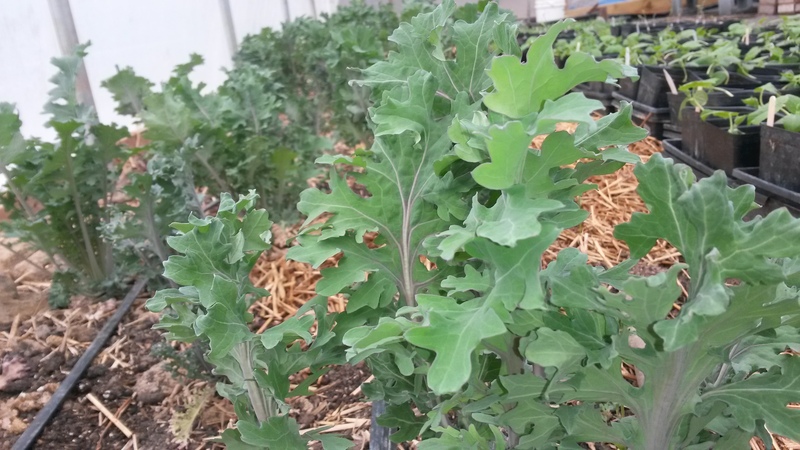 This year we are still picking chard and spinach and kale and salad from the tunnel on March 31, and plan to be picking those crops from the tunnel into April. We have to have faith in the inevitability of the cyclic progression and check our frustrations that grow out of impatience. We have to adjust the business projections and the budget attached to the expectation that “spring” will arrive at a certain point and allow us to plant according to the idyllic schedule that we outlined in January. We take more deep breaths as we contemplate the vulnerability of supporting our family by growing and selling vegetables. We surrender to the dictation of the weather. We meet the weather in the middle. We cover fields to keep the upcoming rain off the beds so that we can plant in that section in a few days. We embrace the row-cover dance, wherein we begin the laborious ritual of covering thousands of plants with blankets to keep them warm during these unseasonably cold nights. 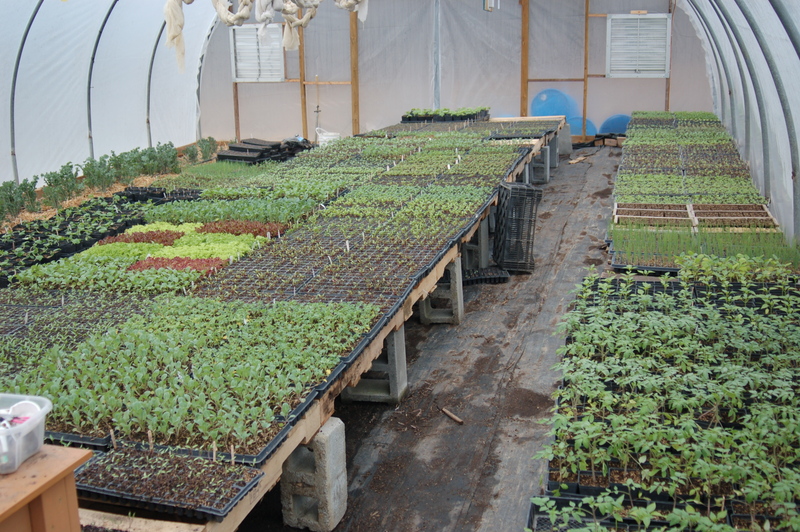 We load up on some more greenhouse heating fuel, and clear out some more space for trays of transplants. We brew some more tea, extracting reassurance from the messages attached to the tea bags. We receive three unsolicited love messages from CSA members telling us how wonderful our produce is and how important it is to be able to nourish their families with our vegetables. We are humbled – by weather, by CSA members. We tell the crew to expect some long days in the next week, as we see the planting window opening up. The vegetables will grow and we will feed people. Chard, Salad Mix, Spinach, Kale (curly), Microgreens, Pepper Jelly, Fermented Jalapenos, and naturally leavened Hearth Baked Bread. **Anyone may order select goods from us, when available, through Fall Line Farms, Richmond’s online farmers’ market. You can use discount code “broadfork” to earn a complimentary 6 month subscription. 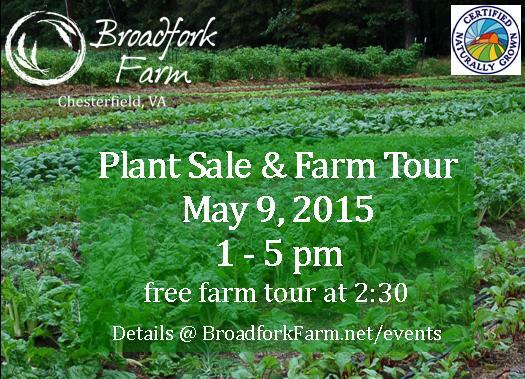 Reminder: Our next Farm Tour is Saturday, May 9th at 2:30. Our Plant Sale is also that afternoon, from 1:00 – 5:00, where you can shop from our full selection of transplants for your garden. Please plan to join us, and spread the word! 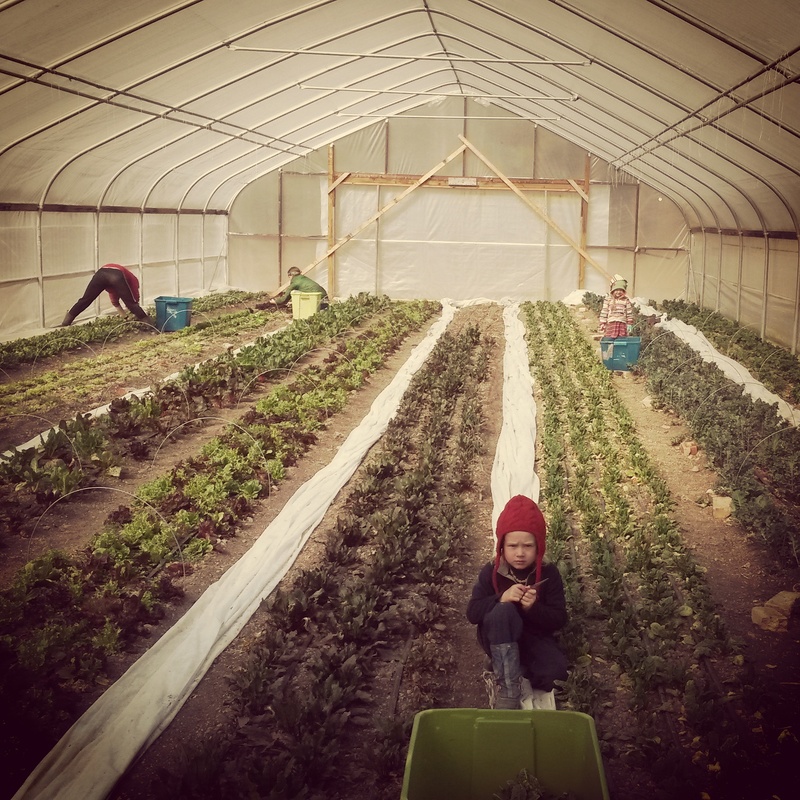 **If you wish to invest in our farm, order from us in 2015, and have first access to our harvest, please Sign up for our 2015 CSA season! Though the main harvest season still awaits, your investment now allows us the funds needed in the early season. Seasons, something we do not have here in California but I am looking forward to. 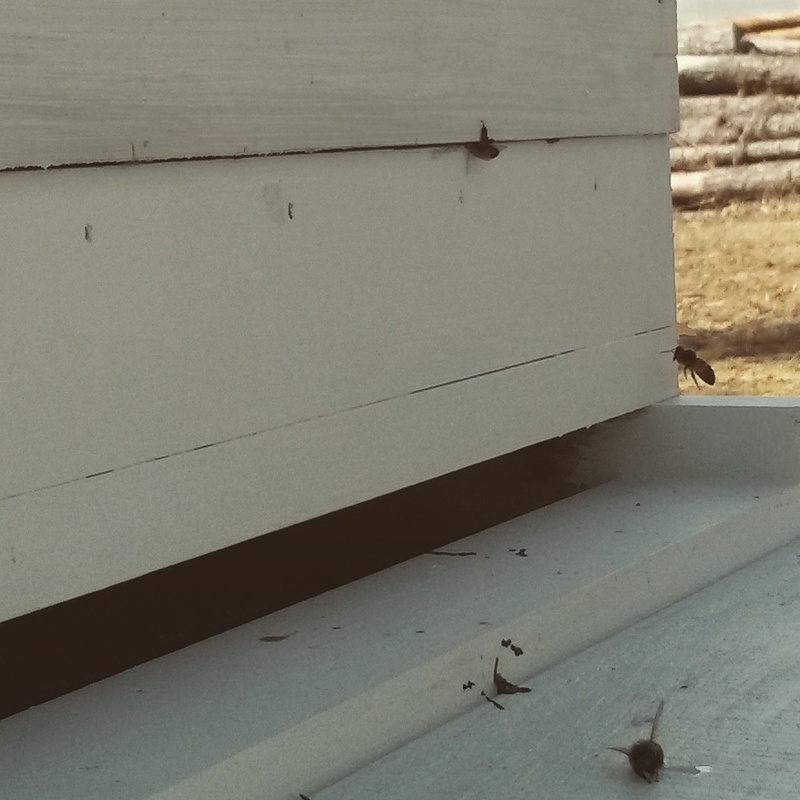 We are moving to New Hampshire and I understand you guys have experience farming there (not that we are planning on farming but even our modest gardening will be an adventure into the world of planting seasonally, and waiting for spring!). Love your blog, hope to visit the farm some day and see you guys again.